In January of 2012, I had a flight to Johannesburg with a 3-day layover. Letaba is a far drive. I only had 72 hours before I had to fly back to Amsterdam again, but I just hád to see Steven. So I rented a car at the airport, spent a very short night at the crew hotel in Sandton and the next morning early drove 600 kilometers to Letaba just to spend a day and a half with him. I phoned Steven as soon as I got in at Phalaborwa gate. He was just as excited as I was! Only 50 kilometers to go!! The drive from Phalaborwa gate to Letaba is beautiful. The road winds through the Mopani veld, along a few beautiful koppies and the Masorini archaeological site, past Nhlanganini dam, where sightings of elephant, buffalo and hippo are almost guaranteed, and lastly over the bridge over the Maswidzudzu just a few kilometers before Letaba. When I cross that last bridge I know I am almost there!! Steven came outside to open the gate for me and to give me a long kiss and a big bear hug. We had not seen each other in weeks. We always have so much to talk about, so we were chatting and stealing kisses, while I took my bags inside. A much-needed braai was the plan for dinner. After spending 10 hours on a plane and 7.5 hours in a car, I just wanted to reconnect to the bush and catch up with Steven. So I made the fire (it is one of my favorite things to do!) and we sat down, watching the flames eating away at the wood, our bushveld TV. The bushbucks that live around the staff village came walking past, a hyena was calling in the distance and a nightjar started singing his typical ‘good Lord deliver us’ song. I was once again in my happy place, and even happier it was with my love! Steven had just put our meat on the fire when it started raining. It was a light drizzle at first so we figured we could still get the meat cooked before it got too wet and the coals would die down. No such luck. The next thing we knew, the rain was coming down in buckets!! Steven rescued the meat and quickly brought it inside, I ran to take the camping chairs under cover and got into the house as soon as I could. Steven was sopping wet. He was standing in the middle of the kitchen, holding the braai container with our half cooked meat, looked at me and started laughing. My clothes were drenched and sticking to my body, I had mud all over my legs and on my face. “Welcome to Africa!” he said!! We were both in stitches! The next morning it was still raining, so we had a bit of a lazy morning inside with breakfast that consisted of some leftover braai meat and braai broodjies we had done on the stove the night before. The weather was so weird. It looked a lot more like Dutch weather…the sky was grey, the rain coming down steady. The poor bushbuck were hiding in the Mopani thickets behind the house, bum into the wind. The birds were quiet. I am sure all the animals were just waiting for the rain to pass. We took my rental car and set off to explore and see what the bush looked like after all this rain. It was wet out there. Very wet. The pan between the staff village and the rest camp was filling up; giant land snails and millipedes were all over the tar roads loving the moisture. The dirt roads around Letaba were getting slippery. Steven almost spun out when he came around the one corner, so we decided to head back home, where we spent the afternoon inside. It was still raining. A cyclone by the name of Dando was making its way up the Mozambican channel, causing chaos in Mozambique and lots and lots of rain there by us. The next morning I woke up early. I always sleep with earplugs in, one of those things you do as a cabin attendant because you need to be able to sleep anywhere and at any time of the day, and I have never been able to shake the habit. But I woke up -earplugs still in my ears- because I heard something loud. At first, I thought it was the air conditioning, but when I took my earplugs out, I could hear properly what was: rain! In was hammering down on the zinc roof. I needed to drive back to Johannesburg to work on the KLM flight to Amsterdam that evening, so I got up. If the weather was this bad, I had better get going soon! I went to the living room and opened the back door to the garden to see how wet it was outside. I could not believe my eyes!!! The little stream that runs behind the house and only flows after good rain was in full flood. Water was spilling over the banks into the garden! I rushed inside to wake up Steven. “I think I need to get going right now!” It took him a few moments to wake up. “The stream behind the house is flowing and the water is already in de garden!” I told Steven as I was frantically packing my bags. Steven jumped into his shorts and had a look out back. He quickly decided; “I am not letting you drive all the way to Joburg in weather like this, I will take you. Let me just go to the office quickly, see if Aaron (Stevens colleague) is able to get the guests out of the trails camp and then we’ll go!” he said. The trails camp is right on the banks of the Olifants River. We came up with a plan. We would drive in two cars to Phalaborwa. I would leave my car at Avis at the airport and Steven would take me in his car to the crew hotel and then go visit his parents. So I followed Steven in my rental car to camp. We stopped on the bridge over the Nhlanganini stream that runs parallel to the staff village entrance road. The stream was coming down in a brown, frothy, angry mass of water. The flowing water sounded like a speeding train, its level already so high that it was almost touching the bottom of the bridge. I was starting to get worried. While Steven was trying to get hold of Aaron in his office, I was phoning SA Airlink to see if there maybe were any flights to Joburg, so we didn’t have to drive in this horrible weather. But Phalaborwa airport was closed. So was the airport in Hoedspruit. The Airlink lady actually laughed at me a bit. Did I honestly think there were aircraft landing in this weather? Well, one could only hope. It took Steven about 15 minutes to find out that Aaron and the guests were safe out of the trails area and on the tar road heading towards Letaba. Thank goodness! Steven had to put some petrol in his car before we could get going, but it was too late for that. The water had started to flood Letaba camp. All in those few short minutes we were in the office. The filling station was partially under water; there was no way we could get petrol there. And also no way we could make it to Phalaborwa without putting fuel in. I followed Steven in his car to the reception area, the highest point in camp, where he was going to leave his car. The water was so deep coming around the corner it came over my bonnet as I drove through! Scary stuff I tell you! Steven left his car keys at reception for in case they had to move it to even higher ground and then he jumped into my car and we left for Johannesburg. 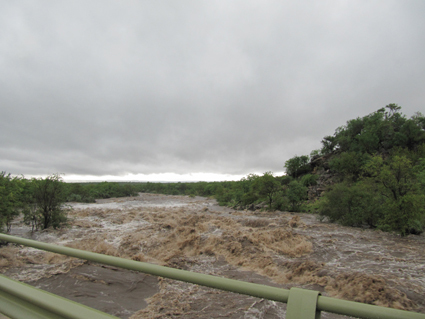 The Maswidzudzu, about five kilometers out of Letaba, was also coming down in flood. As we drove over the little bridge, the water was starting to come over. If we had left five minutes later, the flood would have cut us off and we would have been stuck. I am so relieved we made it over that stream in time. I did not want to have to phone KLM to tell them that I was not going to be able to work that night because I was stuck in the floods in Kruger National Park. Phalaborwa gate was closed soon after we left. No one could get in or out until the water had subsided. Letaba was completely cut off from the outside world. Maswidzudzu just before the water broke over the bridge. On our way to Joburg, one of Stevens neighbors phoned to tell him that the water had come through his house. I felt so bad! If I had just driven on my own, Steven might have been able to do something. But he reassured me that when the water comes, there is nothing you can do last minute to keep it out. So he told them to leave his house and the furniture and just get to safety. Besides, he said, it was more important to get me to Joburg in one piece. Staff village houses under water. I was so grateful to Steven for driving with me. The rain was hectic, the roads slippery at places and visibility very poor. The windscreen wipers could just not keep up with the volume of water. Driving Magoebas kloof between Tzaneen and Polokwane was downright scary. But we made it to the hotel safely. Before I knew it, I was back in uniform and on my way to Amsterdam. Steven drove back to Letaba the next day. There were lots of reports about damage. Especially the area around Hoedspruit was affected badly, receiving (if I am correct) more than 250 mm in 24 hours. Roads had washed away, causing a lot of disruption in the area. In Kruger, the Olifants River had also come down. The water had actually come over the high water bridge, leaving behind a fridge and an enormous tractor tire when the water subsided. When Steven got home, the water in de staff village was also gone, leaving Stevens house and that of some of the neighbors full of stinky, black mud. In times like this though, everyone in the staff village comes together and as a team. They worked very hard to get all the houses cleaned up, curtains washed and sort of liveable again. These days, we have sandbags ready at the back door when the rainy season starts. One can never be too careful or prepared! Shingwedzi felt like in the floods. Wow again. Thanks for the blog. I will keep reading. Hi Wendy! Yes that must have been very traumatic for both staff and guests. 2012 and 2013 were bad flood years! Thank you for taking the time to read my blog! Interesting and enjoyable account, Linda! I am 6 foot 5 inches and I have pics of myself standing by the flood markers at Pafuri (up to my shoulders) and Shingwedzi by the restaurant veranda (higher than my head). Never got caught in it (only just left a couple of days before). Not fun for those who were caught though. Another fascinating episode and the pics are incredible; many thanks Linda for sharing with us . Thanks Sal! 😉 How was your trip? I was living in Hoedspruit during the time of the flood. I could not go to work that morning, it was so crazy. We were all on little islands of land, locked between rivers in flood. I remember driving with an extra set of clothing and water in my car for the next few weeks and even a year or so after dreading rain. Some of our friends had only a ring and a wallet left and others had to fish back there belongings from the area around their house. Hi Linda, do you perhaps know Barry Hopgood, who is my cousin. Think he was at Letaba during this flood. Hi Patricia! I am sorry, I don’t think I do… We got out just in time, so we didn’t spend a lot of time in camp!